In the decades between the French Revolution and the first stirrings of liberalism in the 1830s, German political culture defined itself apart from that of its neighbors to the west. 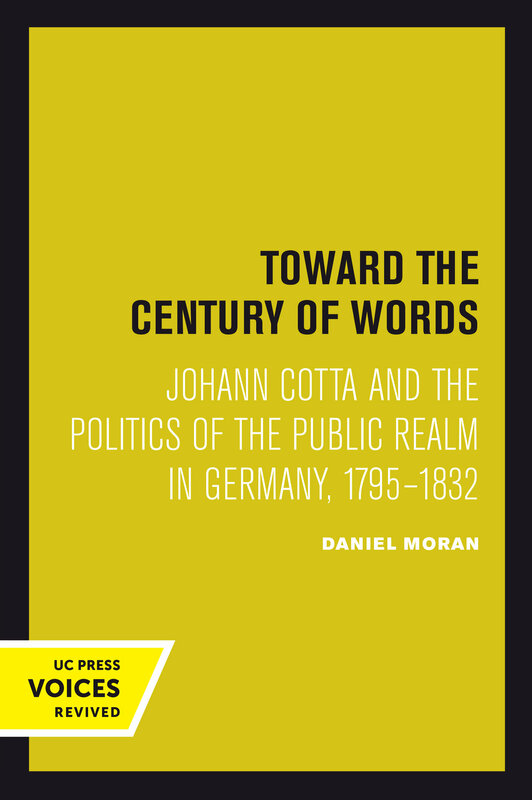 Focusing on the career of Johann Cotta, the preeminent publisher of his generation, this book offers a lens through which we can more fully view and understand these turbulent years. Cotta is a familiar figure in the history of German letters, but his public life has never been studied comprehensively. He financed and directed the Allgemeine Zeitung of Augsburg, which would become one of the great European newspapers of the nineteenth century. He was the first German to convert money and cultural prestige into political power by means of the press. Cotta and his colleagues emerge not as liberals, but as characteristic figures of the Reform era. Their aim was to define and institutionalize a realm of thought and action beyond the control of the state, but short of opposed to it—a "public" realm in which intellectual independence and political loyalty would be equally well served. This title is part of UC Press's Voices Revived program, which commemorates University of California Press’s mission to seek out and cultivate the brightest minds and give them voice, reach, and impact. Drawing on a backlist dating to 1893, Voices Revived makes high-quality, peer-reviewed scholarship accessible once again using print-on-demand technology. This title was originally published in 1990. Daniel Moran is Assistant Professor of History at the University of Northern Colorado.